This time next week, and until 15th September, you can find us at Hall/Stand: 4K49, our temporary home within #RWM16 at Birmingham’s NEC. The RWM (Resource Waste Management) expo bills itself as “the UK’s premier event for resource efficiency and waste management solutions.” and we’d have to agree. It’s the only event of its kind and, in partnership with CIWM, it covers all aspects of waste hierarchy and every element of our industry. Yup, we don’t mind admitting, we’re excited to be back again this year. As well as catching up with friends, customers and colleagues throughout the waste world, we’re really looking forward to meeting new faces and forging new relationships. So what can you expect to find when you drop by to say hello? 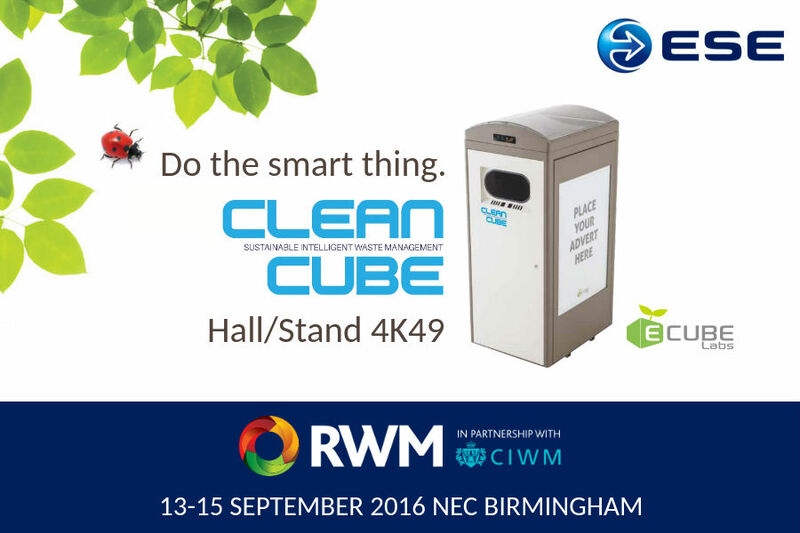 Well, taking centre stage will be Clean Cube – our new, innovative and smart waste management solution. This clever compacting bin uses solar energy to power a smart sensor that detects when the bin is reaching capacity, as well as the compaction device it triggers at this point. Once at absolute capacity, the sensor also alerts the operator that its contents are ready for collection. Intelligent and sustainable, the Clean Cube houses a standard wheelie bin and yet it can hold up to eight times more rubbish, considerably reducing overflow and waste collection by up to 85%. And as if substantial cost savings weren’t enough, Clean Cube also has the ability to generate an income stream via its backlit LED advertising panels and provide a WiFi hotspot. We’re looking forward to sharing all these developments, and the latest pedal operated chute, with all interested parties.